Amy Thomas is a sheltered content teacher at Southport High School. One of the SIOP components that Ms. Thomas used in her classroom was Review and Assessment. After pairing two primary source texts about survival together, then, reading the texts, etc. Ms. Thomas asked students to create their own survival stories. 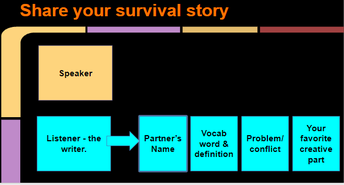 Students synthesized their new learning when creating and sharing their narrative survival stories. Thomas utilized features #27 and #29 for her unit of instruction. Students discuss various words in context while listening and sharing their stories. 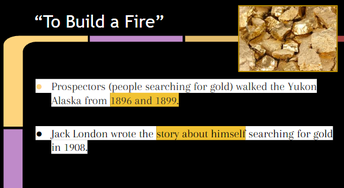 They were able to contextualize their vocabulary learning, as it related to the narratives that were being shared by their classmates, while writing definitions in their own words. This is an example of an effective review of vocabulary because they have been given many exposures to important words through meaningful tasks. Because Ms. Thomas structured the tasks for her unit for students to consistently receive validating feedback, students were able to continue in their new learning and power through some new and challenging work. Feedback can be peer-to-peer and must be focused on content and language. Students in Ms. Thomas's class used sentence frames to provide feedback. "The problem/conflict in your story was_____." "My favorite part of your story was____." 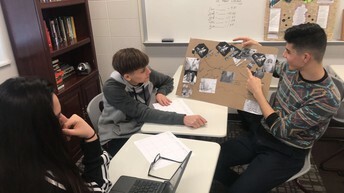 Overall, the student learning was evident, as students were able to articulately interact with texts with proficiency of understanding, then create their own narrative and communicate their ideas succinctly. Great work, Ms. Thomas and class! Kahoot - the kids love it. It is a great tool for the SIOP component of Review and Assessment as it provides feedback and comprehensive review. Have you tried Quizizz as well? It is similar to Kahoot but allows for different pacing. Check it out if you haven't already! Section 3 of IDOE's Accessibility and Accommodations Guidance describes accommodations as changes to standardized testing materials or procedures to support students with a disability, students with a disability who are English Learners, or students with limited English proficiency to participate in an assessment in a way that measures the student’s abilities. An accommodation does not change the construct being measured. These accommodations must be documented formally in the student’s educational record and be offered on classroom assessments on a regular basis. Section 4 describes allowable accommodations for English Learners. Please check a student's ILP, located in Skyward, for their specific accommodations. Please check with your building's Test Coordinator and EL teacher if you think a student should have additional accommodations.